The flight from Los Angeles to Auckland was my most successful long-haul flight yet. We left at 10:30pm local time and arrived at 6am local time plus one day so it provided the perfect opportunity to sleep according to our time zone and then wake up in the early morning in New Zealand. We flew Air New Zealand and it was excellent — it was roomy, the food was good, they served complimentary wine with dinner, and they had lots of empty seats which we got to take advantage of. In Economy Plus, they have rows where the footrests pull up to create a bed platform and I was able to slide over to an empty row and sleep horizontal. It was probably the closest I’ll ever get to flying First Class. We picked up our rental car, checked into our Airbnb (listing here) in the Auckland suburbs, and then made our way downtown for the day. Our Airbnb hosts, Heleen and Loffie, were gracious, kind, and generous during our stay and set the bar super high for hosts. We talked through our plans for the North Island and they gave us very helpful recommendations for our journey. We were sad to leave them after just one day -- a sentiment we felt often during the trip since we covered ground so quickly. In Auckland, we parked at the Sky Tower, had lunch at Elliott Stables which has a huge variety of food vendors to choose from, walked by the Viaduct, and spent the afternoon reading at Albert Park near the University of Auckland. On our way back to the car we stumbled upon a couple professional rugby teams who were at Sky Tower for a fan meet and greet, and following that we headed back for dinner near our Airbnb. While other sights outside of Auckland were calling, we were both glad to get a glimpse of this city while we acclimated to the time zone on the first day. Auckland's vibe is very similar to Seattle and it quickly felt familiar to us in a day’s time. The next day we headed to the Coromandel Peninsula which was a 2.5 hour drive east of Auckland. The drive to Coromandel is serene, yet windy, and the hillsides are covered in thick green tropical foliage. We parked in a public car park in Hahei, passed on the $10 shuttle, and instead walked to Cathedral Cove beach which was a 7-mile loop in total. Pack light since it’ll be a decent workout and pack a lunch since the beach is quite far from the couple cafes in town. I neglected to unpack my laptop and other electronics out of excitement to get to the beach and ended up carrying about 25 pounds with me the whole day. By the end of it I was ready to chuck my pack into the ocean. There are stunning views all along the trail leading down to the ocean. The beach was fairly busy, but we stayed until late in the afternoon and it cleared out near the end. Cathedral Cove is a huge cave that the shoreline runs through and there are unique rock formations throughout the spot. 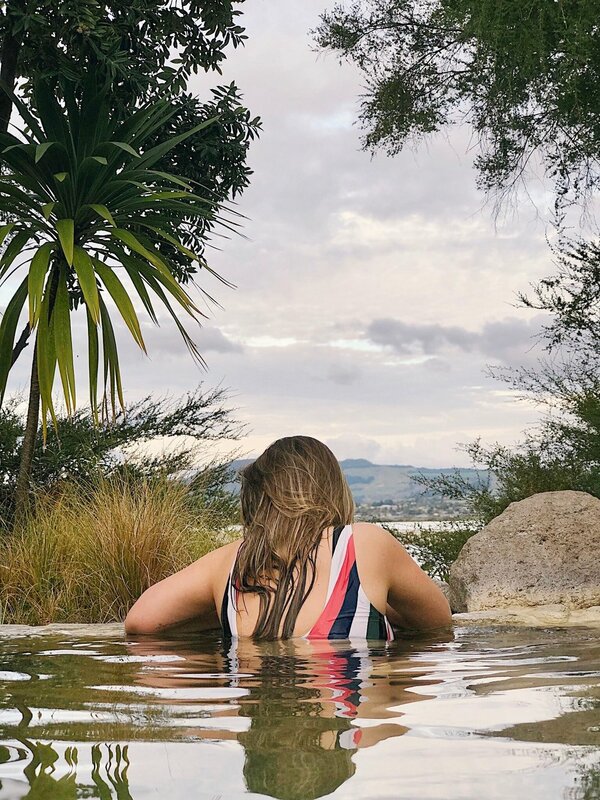 That evening we grabbed a delicious pizza and ginger beers from Manaia Kitchen & Bar and headed out into rural Coromandel near Hikuai to find our Airbnb. Look up at night here. The star strewn night skies are INCREDIBLE. We drove from Hikaui to Rotorua and stopped at the Mamaku Blueberry Farm for brunch (we have Heleen to thank for this one!) for a lovely breakfast. The thing about stops like this though is that they ruin you in a way because other blueberries after this just don’t taste the same. Kphil and I split orders of blueberry pancakes and the ham and veggie quiche with coffee and takeaway blueberry muffins. It was great to wake up slow and have a relaxing morning after the hike we did the day prior. That morning we were going back and forth on whether we wanted to do the Hobbiton Tour in Rotorua near Matamata because it seemed a bit pricey for what was included. Although I love the Lord of the Rings films, in the end I was happy with our decision to skip it. Instead we headed to the redwood forests and did the Redwoods Treewalk which I cannot recommend enough. The treewalk path elevates you from 20 to 40 feet above ground on suspension bridges along 116-year-old majestic redwoods so you have a bird’s eye view of the forest. We chose to grab the day and night pass since they illuminate the trees at night and we had time to make a return visit that evening. We spent the following morning grabbing coffee and using the wifi at the Rotorua library to book more of our upcoming accommodations and transportation. We truly booked this trip completely as we went (which had both pros and cons! ), often booking our places to stay the day of and deciding our routes only a few days before. We had originally planned to spend the night in Taupo and use our fourth day to do the Tongariro Alpine Crossing Day Hike but the bad weather dashed any hopes we had for that and the more we looked into the trek, the more we realized we likely would have struggled without the right footwear and gear for it (here's a great post describing the hike that I found to be very helpful in our decision making). We made the most of our afternoon though and headed to the hot springs at the Polynesian Spa. This is a nice little getaway right in the main town area and had various pools with different minerals that were good for either the skin or muscles. We found that prioritizing moments of rest were key to avoid burnout as we were constantly walking, driving, moving, deciding, and planning. We drove from Rotorua and stayed in Taupo that evening. We sought out wifi and coffee and The Coffee Club chain quickly became our go-to spot for both. We had breakfast there while overlooking Lake Taupo and took shelter during the crazy rainstorm that morning while we rebooked our camper van rental. We had booked through a third-party site that was supposed to confirm availability and get back to us. We tried to book a Britz camper but ultimately had to book a Jucy camper when our third-party reservation fell through. This day was one of our longer driving days so we spent most of our time on the road making our way to Wellington that evening. We had a good dinner at Gasworks and then spent the evening at our Airbnb (listing here) talking with our hosts and playing with their 10-week-old golden retriever puppy named Charlie. Since Kphil and I were splitting costs, we kept an account of what we spent and I'm happy to share that below. Our costs for one week on the North Island came to $697.90 USD for each of us, or roughly $100 a day (this does not include airfare expenses). So what did that look like? Our Airbnbs throughout the week varied in quality, but all were solid stays and we did a mix of dining out and grabbing inexpensive, takeaway meals. As for distance traveled with that gas cost, we covered almost a full length of the island by car. We didn't do any expensive activities or tours, but we did do a few smaller things like the treewalk and spa day. And finally, I will save all my emotional gushing about the blessing that was traveling with Kphil for a future post, but one of my biggest recommendations coming out of this is to not visit New Zealand alone (again, will elaborate more on the 'why' soon) as it was a huge benefit financially to split costs given the style of travel we chose.